My choice has been an analog modem for a long time, but today I have an ADSL for the external connection and ethernet cables for my LAN. The ADSL signal runs on the telephone wires, along with the voice signal used by phones. The phones use low frequency electric waves to transmit voice; ADSL, on the same cables, put higher frequencies waves, containing binary data, coded in a very complicated way, to reach an high speed of many Mbits/sec. Data and voice travel together and they have to be separated at the arrival by a splitter. Low frequency waves, with voice, go to your telephone, high frequency waves go to an ADSL modem, which extract coded data from the electrical signals when receiving, and code data into electrical waves when transmitting. For an ADSL connection a splitter and a modem are needed. To connect your computers together and make your LAN, you need something to which plug all the cables coming from your computers. This is an ethernet repeater (or an ethernet switch). The last thing you need is something which manage the traffic and knows what is directed to each computer an what is directed to the internet. This is a router. So you need 4 things: a splitter and a modem to connect to internet a router and a switch to manage your traffic, and cables of course. For about 50 euros you can find a little box integrating the modem, the router, the switch and also a firewall to protect your network from intruders. You can see the cable coming from the main telephone jack (number 1 in the picture), entering the splitter (at number 2). From the splitter two cables start, one, with telephone signals, goes to the telephones (number 3), the other cable(4) goes to the ADSL modem-router-switch(5). From the router a number of cables go to the different rooms of the house(6). The router power supply cable is at point 7 in the picture. the splitter is from Matsuyama Electronics, but different brands ships similar products. Telephone and computer plugs, and cables, are different but may be confused, having a similar shape. 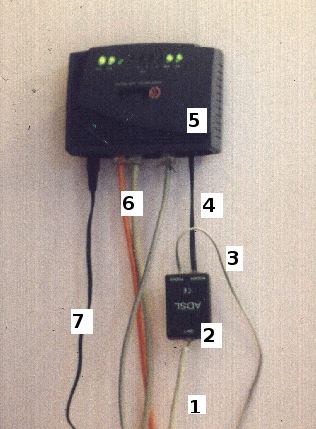 Telephone cables are at points: 1,2,3,4 in the picture, computer cables at point 6. The telephone plug is named RJ11, and has 6 pins, only 2 of which are usually used; the computer cable plug is named RJ45 and has 8 pins (only 4 used for 10-100 Mbit network, 8 for 1000 Mbit). The computer plug can't fit into the telephone socket, being bigger, but you can plug the telephone cable into the net socket, obtaining a non-working connection. 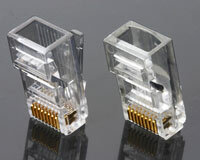 In the pictures Rj11 (left) and RJ 45 plugs (right). And now cables; short (some meters) patch cords are common in computer shops, but if you have to cover longer distances you have to wire your house. You can find a lot of internet sites explaining how to wire your house; many sites try to sell you their equipments, others present semi-professionale installations, but I want simple things, with minimum expense. All you need some cable, some RJ45 plugs and a crimping tool, to connect the plugs to the cables. 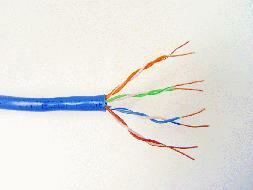 The network cables in use today are twisted pair category 5e, or category 6. Forget coaxial cables, they belong to the past. Twisted pair cables contain 4 pair of little wires, the wires of each pair being wrapped together to minimize electrical interference. You can find UTP cables, with no external shielding, or FTP cables, with a shield foil around the wires. FTP cables are thicker and more difficult to crimp. 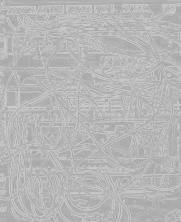 The different cables are well described in the wikipedia. The cable cost around 0.30-0.50 euro/meter. 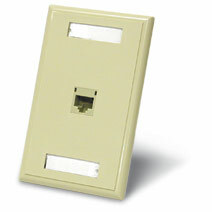 Wall outlet: usually cables are attached to a wall outlet and a patch cord goes from the outlet to the computer or the switch. Wall outlet costs about 10 euro each one. To simplify things i didn't use wall outlet, but crimped RJ45 plugs directly on the cable coming out of the wall, very un-professional, but cheap and easy. So I proceeded in this way: I bough some cable, then used the same paths in the walls used by the telephone lines to run the cables through the walls. The professional who installed telephones in my house used a pair of very thin, unshielded wires (really, less professional than my home network), so the path was nearly empty and I had no problem to pull the UTP cables trough the conduits in the walls. A fish tape can help you if you have a long path to follow. When the cables are in place you have to crimp connectors to the cable ends. 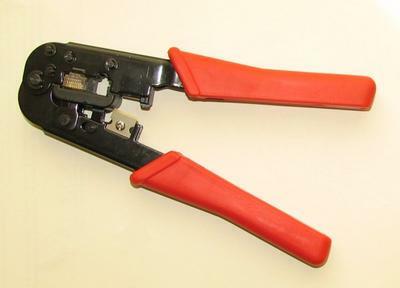 I found a good description of RJ45 crimping at: hyperlinesystems Italia it is in Italian language, but the pictures are very clear. You have to strip the cable, to unfold he pairs, carefully fit the pairs in the connector and to use the crimping tool to block the wires into the connector.